Now, my Christian brethren, do you bear it in your soul, instead of thanking and glorifying the sweetest Jesus Christ, and God the Father your Creator, you dishonor Him and intimidate Him with the demonic acts which you do on the day of His Resurrection? He endured so much to free you from sin, and you again bring it back to life? He resurrected to raise you from evil, and you again fall? And when? On the same days on which He raised you. O great ingratitude! O unheard of hard-hearted Christians! You who throughout Holy Great Lent and Holy Week lift up your hands and pray and do your cross, and when Pascha comes, you dare to make those hands instruments of sin, playing tambourines and lyres and other diabolical games? You who with your tongue and lips commune of the Body and Blood of Christ and chant such spiritual and divine songs on the day of Pascha, and after with the same tongue and lips sing pornographic and diabolic songs? You who with your legs stand in the Temple of God and do prostrations and bend your knees to venerate Almighty God, and when the Bright Day comes you bear it in your heart to beat the same legs? To jump like rams? To dance like crazy people and the demonically possessed? And with those naughty moves you would venerate the devil? You, to conclude, become temples of God and the Holy Spirit during the holy days of Great Lent and Pascha, and you the same again become temples of the devil and evil spirits with satanic games, dances and songs? These are things that do not match, acts which do not blend, because what union is there between light and darkness? The devil with Christ? The temple of God with the temple of idols? As Paul says: "Do not be yoked together with unbelievers. 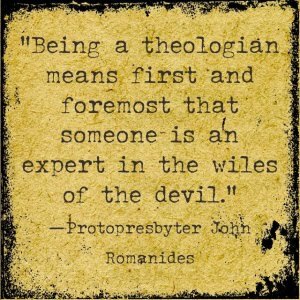 For what do righteousness and wickedness have in common? Or what fellowship can light have with darkness?" (2 Cor. 6:14). Therefore we say that during Pascha and Bright Week Christians should not play such games, dance and sing songs, and likewise during the days of Pascha Christians should not shoot rifles or pistols or other similar guns. Because the Risen Christ, not only has He no need of such things, but instead He hates and abhors them because - a) they traumatize many people and often get killed - b) from the noise Christians cannot hear the services and spiritual hymns and the songs of Resurrection. 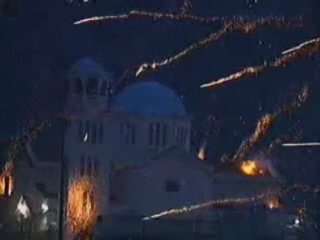 And if in the old days there was gunpowder and Christians shot off these guns during Pascha, it is certain that all the Holy Fathers would have written about them and struggled with this evil and national habit. It is a national habit during festivals to shoot these things off and not Christian. It is the Christian habit only to strike the sacred bells and the simantron and to chant "Christ is Risen!" and other joy-giving songs of the Holy Resurrection. From Christians of Good Repute (Χρηστοήθεια των Χριστιανών) by St. Nikodemos the Hagiorite. Translated by John Sanidopoulos.